Listening to what young people tell us is important to them is key in how we develop our priorities and work programmes. It also played an important part in the creation of our Young Person’s Health and Wellbeing Framework, which we are delighted to be launching this Thursday the 29th of January. In keeping with this, last November, we took part in the Children's Commissioner's Takeover Day with the aim of promoting the welfare of children and young people, by having them work with us for a day. They benefitted from the opportunity to experience the world of work and make their voices heard, while we gained a fresh perspective on what young people think about the health challenges they face. “I was invited to take part in PHE’s takeover day by sexual health charity Brook. Having no idea what to expect before I turned up, and not even really understanding what it is PHE do I was pleasantly surprised by the day. The staff that I met seemed genuinely interested in listening to what I have to say. Unfortunately I haven’t always found this to be true from previous experiences, so it was really refreshing to meet with people who are truly passionate about their work and can relate to young people. I was shocked to learn that between the ages of 5-7 only 23% of girls meet the recommended levels of physical activity. This drops to just 8% between those aged 13 to 15. The figures are not as bad for boys, but I still find it alarming that levels of physical activity are so poor at such a young age. I learned about PHE’s ‘seven priorities’ which include tackling obesity, reducing smoking and the harm from alcohol, giving children the best start in life, reducing the risk of dementia, cutting tuberculosis rates and tackling antimicrobial resistance. 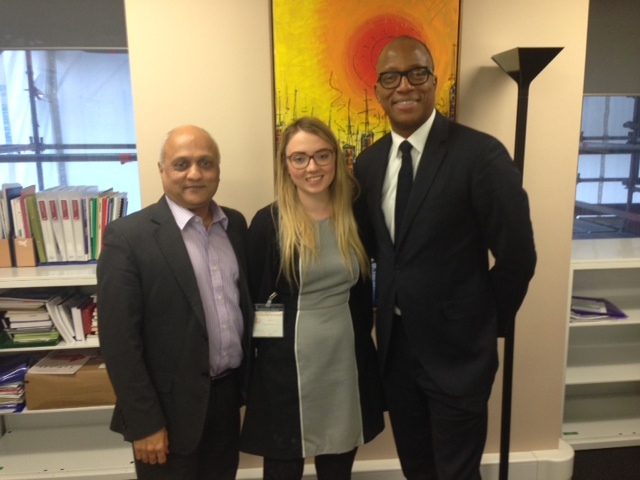 I was given the exciting opportunity to speak to Professor Kevin Fenton the National Director of Health and Wellbeing, and Eustace de Sousa, the National Lead for Children, Young People and Families. Whenever I meet anybody in a senior professional position I always feel as if I have a duty to represent young people and ask questions on behalf of them. I spoke about the lack of education regarding alcohol and tobacco concerning its cause of vascular dementia. Interestingly this relates to three of the seven priorities PHE are focusing on. It was made quite clear to me that PHE are aware that having sound proof Personal Social and Health Education (PSHE) improves knowledge and attitudes towards this subject. In relation to mental health, we also spoke about the fact it is not only schools that are struggling to educate people, it is the same in work places and in society as a whole. It is unfair to expect schoolteachers to educate children and young people about topics they do not fully understand themselves. This overlaps with some of the discussions at NHS England’s children’s takeover day and is something that I find comes up as an issue time and time again for young people. I mentioned some of the difficulties young transgender people face; such as, there is (to my knowledge) only one place they can visit in the UK for Gender Identity Development Services. Professor Kevin Fenton was aware of this and informed me that NHS England is currently working to improve this. It was reassuring to hear that he was already aware of this situation, and showed a genuine interest in its improvement. Thanks for the blog and great to see the engagement with young people. I am conscious that Viv Bennett at Public Helath England (PHE) wrote a great blog on the young people forum too. I think the Children's take Over day is really good, but may be there needs to be a more comprehensive look at this beyond one day. What a fantastic privilege to listen and learn from Rachel and I guess it is about ensuring none of her vital insight is lost, which I am sure it will not be. Good on Rachel too.!!! I will look out for the launch on Thursday of the Young Person’s Health and Wellbeing Framework. May be this opportunity could be look at through the PHE Local Centres across England too, along with the work Christine McCartney at PHE does, and does so well.